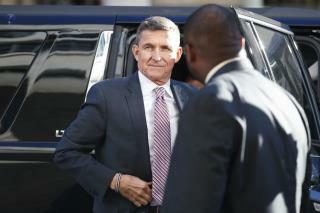 (Newser) – Michael Flynn's fate was in the hands of Judge Emmet Sullivan on Tuesday, and the federal judge dished out a surprise twist: The sentencing ended up being delayed after Sullivan suggested Flynn could actually get prison time despite the prosecution's recommendation he get none. Sullivan was doing no coddling at the start. "Arguably, you sold your country out," is how he put it to President Trump's former national security adviser, who pleaded guilty to lying to the FBI about his conversations with the Russian ambassador to the US. Sullivan added he "can't hide my disgust, my disdain" at Flynn's misdeeds. All this palsie wishy wash stuff from a judge to Flynn is very suspicious. If Flynn was black, hang him high. The fix is in. Flynn walks. Withhold the sentencing until Trump can join you Mr. Flynn.